Extremely accurate and stable solutions. YSI turbidity solutions calibrate your instruments for maximum accuracy. Extremely accurate and stable solutions. We recommend that YSI-certified polymer-based standards are used for best results. For example: A 20 NTU labeled bottle from company x will actually read 25 NTU using a properly calibrated YSI 6136 turbidity sensor. 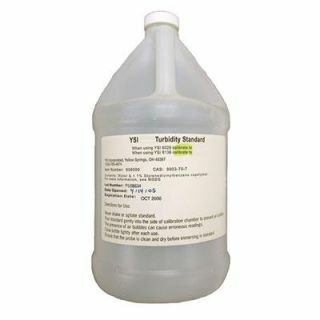 Each turbidity standard comes in a 1 gallon (plastic) container.